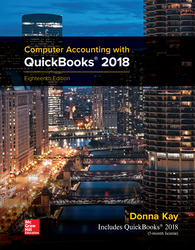 - Full course solution: Computer Accounting with QuickBooks 2018 includes 5 months access to QuickBooks Accountant 2018 software. Add Connect to provide additional resources and support. - 3 step-approach: Computer Accounting with QuickBooks 2018 uses a 3 step approach to simplify and streamline learning QuickBooks. - Certification Alignment: Chapter 17 Quick Review Guide streamlines students’ review for the QuickBooks User Certification examination.